While I'm giving updates on all of Campbell's big boy changes I may as well let everyone know how the big boy bed is going. Honestly, it's been no big deal at all. I had a feeling that he would be just fine and I think I could have transitioned him a lot sooner but I was nervous. And with a newborn in the house and not knowing what to expect with that, I decided to wait. I think it was a good decision to wait but in hindsight, it would have been just fine. Campbell does get out of his bed some. At nap time before he falls asleep sometimes he gets up, grabs a book or toy, then hops back in bed to quietly play with it. I actually don't mind that he does that. I've just started putting him down for naps 30 minutes earlier than I usually do so he can play in bed for 30 minutes. After 30 minutes if he hasn't fallen asleep I go in there, take his toys away and tell him he needs to take his nap. And he does. At night he goes to bed right away and sleeps his 11 hours like usual. He's usually still laying in his bed when we get him in the morning but sometimes he gets up and is always looking out of the window for some reason! I think he's checking to make sure it's daylight. Those blackout curtains make his room super dark!! I'm not surprised that Campbell has done so well with it but I am proud of him! I'm glad he did what I expected him to and that we don't have to go back to the crib. 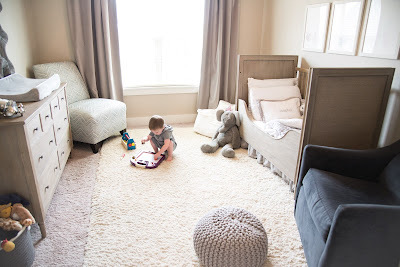 Campbell spends so much more time in his room now and climbs in his bed all the time to read books or play with toys. 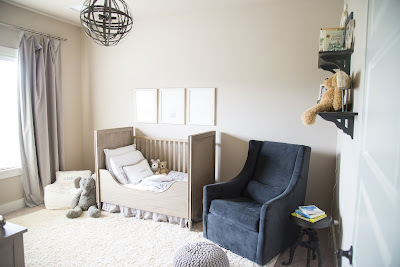 I love how his room looks with his little toddler bed and Scott and I actually really like the look of having the crib rail on the back so we're just going to leave it. We felt like there would be so much empty wall space behind the low bed and the prints above the crib/bed and that it might look weird. Yay for big boy beds! Such a cute post. 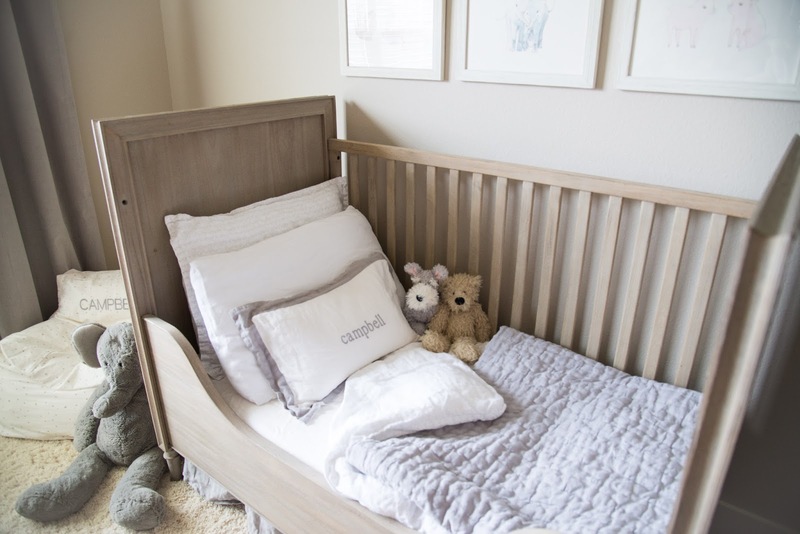 Your campbell really behaved like a big boy else toddlers show extreme tantrum when they get shifted to bed from crib.